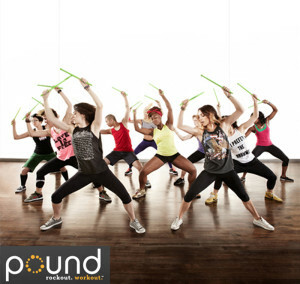 POUND is a full-body cardio jam session, combining light resistance with constant simulated drumming. The workout fuses cardio, Pilates, isometric movements, plyometrics and Isometric poses into a 45-minute series. Burn between 400 and 900+ calories per hour, strengthen and sculpt infrequently used muscles, and drum your way to a leaner, slimmer physique – all while rocking out to your favorite music! 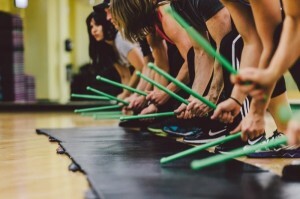 Through continual upper body motion using our lightly weighted drumsticks, called Ripstix™, you’ll turn into a calorie-torching drummer, POUNDing off pounds as each song flies by. Rock, rap, dubstep, pop and old school music fuse to create the POUNDtrack series, which is hand-selected by music enthusiasts, drummers and POUND founders Kirsten Potenza and Cristina Peerenboom. You’ll actually hear your body working, each move generating a sound. Think you’re not coordinated? Hearing yourself and adjusting based on the sounds you make will fix that in a snap. Want to get more out of your workout? Just POUND harder and listen to yourself get in shape. We’ve made it easy to improve your body, your coordination, and your agility based on hearing your body work with Ripstix™. SO FUN, YOU WON’T BE ABLE TO STAY AWAY. If any fitness regimen is going to work, it has to become part of your lifestyle. POUND is an easy routine to “stick” with, since it yields fast results, it’s fun, and it lets you Rock out while you work out! 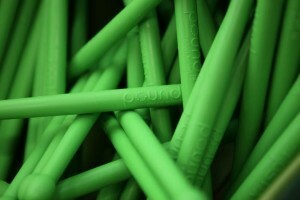 The stress relief and intense workout experienced by POUND-goers keeps them coming back for more! POUND IS ANYWHERE YOU ARE. Your POUND experience — whether in-home, in-gym, outdoors, or while traveling — inspires confidence, self-improvement and freedom from the ordinary. Whether you take a class, teach a class or follow along at home, you are part of the POUND Posse.